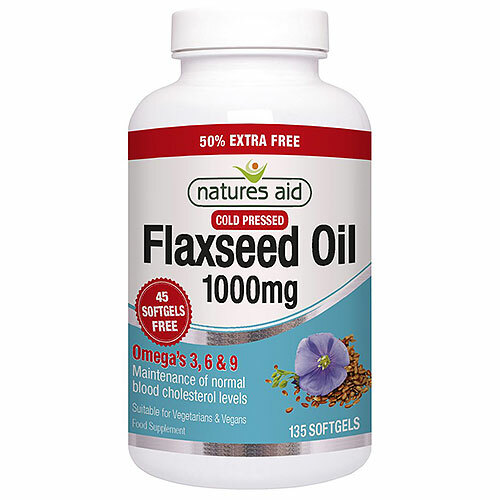 Natures Aid Flaxseed Oil capsules contain only the finest cold pressed and filtered oil which provides a source of Omega 3, 6 and 9 fatty acids. The Omega 3 & 6 essential fatty acids play a role in maintaining a healthy circulatory system, in brain function and the development and maintenance of body functions. Take 1-6 capsules per day with food. Do not exceed recommended intake. Below are reviews of Natures Aid Flaxseed Oil - 50% EXTRA FREE 90+45 Capsules by bodykind customers. If you have tried this product we'd love to hear what you think so please leave a review. 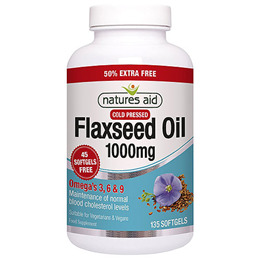 Natures Aid Flaxseed Oil capsules contain only the finest cold pressed and filtered oil which provides a source of Omega 3, 6 and 9 fatty acids. The Omega 3 & 6 essential fatty acids play a role in maintaining a healthy circulatory system.